You get exactly 5 points to allocate in any stat that you wish every time that you level. There is no stat cap as of the date that this guide was written either. There are a few ways that you can go here. You should know by now that the weapons have stat requirements, and ours are Dex / Spr. You will now have a choice as to where you want the remaining points to go. I can not tell you “the best” way to go because there is a lot of room for flexibility in that area. However, myself and a lot of players decide that with those remaining points that are left over (after we allocate the points we need into our weapon req.’s) should go to health. The reasons for this are listed below. #1 Having a high health stat will ensure that you don’t get interrupted nearly as often. #2 Health increases that green bar as well as your health bar, so in PVP (and PvE) it will help you survive MUCH longer. Note The other popular build is to put the majority of the remaining points into dex. This however will make you more of a glass cannon, so keep that in mind if you decide to go that route. There are a lot of opinions on how to spec your character skill wise, and like the stat point system this can be modified widely to fit your personal taste. At the endgame you have enough points to get just about every single skill maxed out. However, until then you are forced to choose wisely as I pointed out before. It isn’t until your very high level that you start getting more points than you know what to do with. 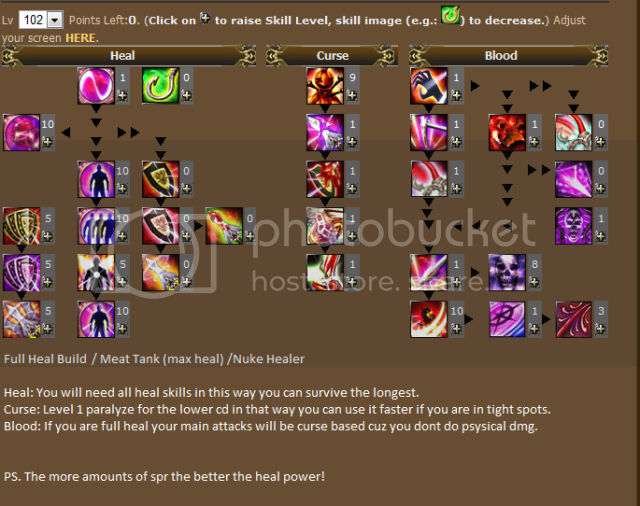 This build gives the player the damage of the blood, yet the support role as a healer/buffer. The buffs that Segnale get are the best in game. This is a pretty safe build because it allows you to do some damage, yet allowing you the option to play a role in groups. There are a few variations, but the idea is to spec heavily (if not all) into these 2 trees. The main concept underlying this build is to pvp and deal damage. Leaving the healing and buffing completely behind, and simply focusing on dealing as much damage as possible. However the curse line spells as of now have extremely long casting timers which limits this builds functionality. This is mainly a party healer build. It is not recommended to spec this route if you primarily solo kill. The Curse line gives some great skills, they are centered around debuffing mobs so others can kill it quicker. Therefore, players that wish to do this also put points into the blood line spells that have “curse” effects. This route is for PURE party play. Again however, the curse line spells as of now have extremely long casting timers which limits this builds functionality. Although speccing heavily into the Healing tree makes you a very popular, effective, and flexible healer. Note I simply outline the popular build options that you may decide to use. I only wish to generalize and do not want to place bias on any one build type. If you have fun with a build you put together and feel it is effective than that is exactly what is best for you. This may or may not work for all players. Ok, this section is here to help you decide what skills are necessary. I am going to try NOT to put my personal beliefs into this section, but outline popular biases that other experienced segnales have had. This is the area of the game that allows you the player to put your personal “flare” on your specific Segnale. Healing Mastery– This skill increases your passive mana regen, and most players decide to max this early on for that reason. Self healing– This is a good skill to use while grinding solo mobs or in pvp. Its the most mana effective one to self heal with. The players that do decide to get this, usually put only one point into it (until later levels), so they can self heal without switching targets. Wound healing– This is a good skill to use early on if your grouping or duoing. It is the most mana efficient single target heal we get. It is a good heal to use if you don’t want to waste mana overhealing your tank, or if you simply need a fast heal. Hyper heal– This is a truely magnificent heal. This is our area of effect heal. Anyone within the casting radius get the heal. However if a player wanders out of the radius before its cast is done they won’t get the effect. Likewise, if a player is outside the radius, and at the last minute runs into the radius they will get the effect. Recover– This is your resurrect spell. Most players only put one point into this, more points reduce the resurrection sickness and its duration. Fast healing– This healing is your healing over time spell. This spell is amazing. Dark Circle– This skill decreases your mana over time and adds curse to your attacks. This skill is a good buff because it makes ALL your attacks curse based, and so the curse mastery skill will stack with it. Your build will determine whether or not to invest heavily into this buff. Divine Shield– more mana costly, and generally weaker at higher levels. Most players prefer these. Curse Mastery– This spell increases the attack power of all your curse spells. This means that all your curse based attacks in the blood line will do more damage as you put points into this. It also increases the potency of curse gems when using curse based skills. For more info on this see the section below on Gems. Paralyze– Causes the enemy to be “rooted” to the ground. You need at least one point in the other curse spells to get this one, and its very popular at the higher levels due to its reletivly long duration (or short duration depending on who you talk to). important as other skills at lower levels. get dread nail which has the same effect but more damage. Backdraft– This is your first curse based attack. It also happens to be the shortest recasting skill you’ll ever get. only one, and some keep a few points into it. Its up to you. till higher levels to start investing. does not get interrupted as often. it. But as an AOE, this spell stinks! it`s a AOE and it does a lot damage. Speed of the enemy will decrease more. Mornie– This skill let you go in transup. Curse Cry– this attack hits the enemy 3 times. Curse cry is a area of effect skill. The skill is a powerful one and hits hard. The amount of shield and hp increase. Skills for a certain amount of time. Good to interrupt combos. Shield Field– This is a AOE which regenerate the shield of your party members. This is one of the BEST skills ingame. —>To target yourself in order to use Wound Healing or buffs, press the letter E on your keyboard. Or you can go to option and put auto self target on. When you do this you cant ress other people unless they are in your party, so make sure you turn it off while clearing some ip for others. —>To Switch between hotbar 1 and 2 press the letter Z on your keyboard. —>Make sure you never stray too far from your tank. If you rely heavily on Hyper Heal then this is vital because tanks have a habit of being out of the healing radius at the last minute. —>Keep your health bar under control first and foremost! You can always use Recover on them later if they die, but if you die then they have a long run. —>Attack the Monster! Segnales do good damage and people know it. A wise Segnale will know how to attack, and at the same time monitor the health of the party. —>Don’t be afraid to step back for a minute when the going gets tough to concentrate on healing and buffing. All classes can attack and do damage, but no one else can fill the role of a healer. If you have to step back in order to keep the tank from dieing, then politely do so, and when the situation is under control resume your havoc. This section is geared towards teaching you how to upgrade your weapons using Gems. Keep in mind that the system holds true whether its a Gem, Ring, necklace, inherent bonus on blue magic armor, or any other form. First lets define a few things. Magic damage– A broad category of damage. All damage is comprised of 2 main categories; Magic and Physical damage. Magic damage is comprised of 5 subcategories. Element damage– The subcategories of magic damage. The subcategories are poison, curse, lightening, Fire, and ice. Spells often will tell you in the description if it deals this type of damage. Physical damage– A broad category of damage. Auto attacks and skills can deal this type of damage. Spells often will tell you in the description if it deals this type of damage. summary explanation It kinda all makes sense if you think about it. —>”+X Increased magic” will only increase your magic attacks. The same holds true for “+X increased physical damage” gems. —> The “+ X (ice, fire, Poison, curse, or lightening) Damage” type gems, add that type of damage to all your physical attacks. However they will also add that damage to your spell ONLY if it deals that type of damage. The same rule applies to the “+% + X (ice, fire, Poison, or lightening) Damage” type gems as well. —> Note that Segnales get a bit more benefit out of the curse type gems naturally because we use Curse Damage in some of our spells. The same holds true for other classes that deal a specific type of damage in their spells. —> +% Curse Gems stack with each other when they are added to your weapon. Curse type gems– Curse Mastery does work with curse type gems in a different way when it comes to curse spells. You will see more of an increase in your curse spells when you use curse gems. This is because the +x curse damage gets added in to the spell damage, and then the Curse Mastery comes along and multiplies that damage by its predefined %. This does not hold true for your physical attacks though because if you remember correctly, curse mastery only works on spell damage. Your choice of build in dekaron depends on which place you wish to fulfill on the battlefield. Some people like to be healers, while others are more for attacking the enemy. This choice logically affects the use of your stat points in the so-called “builds”. The ones I’ll show you are some of the most-used and they have shown their usability through time. The choice is all yours. Just keep in mind that you will receive only one free restat from your classmaster per account. Okay, here we go! these stats and their usefulness. There is on this moment no knowing of a stat cap. This stat is useless to train and does not change a thing. Physical Defense: Reduces physical damage. most-used and they have shown their usability through time. lot of Mp to spam their skills really hard. How to realize this build? -Lowered Health leads to being knock backed and interrupted more often and therefore less overall effectiveness. be effective in both pvp and pve overall. 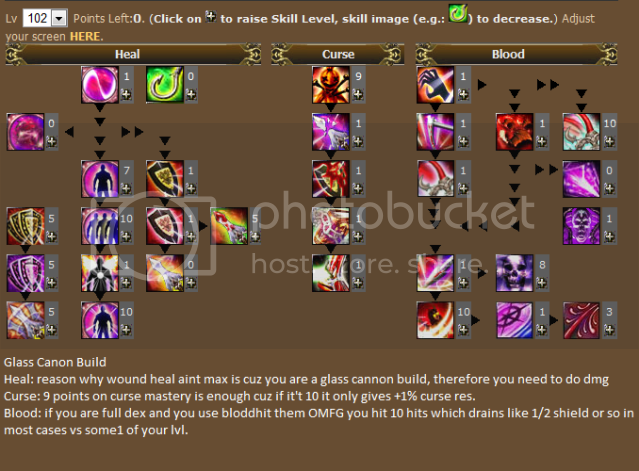 -Curse damage spells will be increased significantly.